It’s hard to believe that there have been 20 Need for Speed games. EA’s long-running racing franchise has run the gamut of niche racing genres, from simulation to action-adventure to neon-fueled illegal circuits. For the last generation, Burnout veterans Criterion took over the main mantle of development and revitalized series golden child Hot Pursuit, to be followed later with another remake, Most Wanted (with a couple of lackluster titles from other developers in between). With the downsizing of that developer soon after, development duties fell to Ghost Games, composed largely of those same people. The quality of those games lives on, and Need for Speed has never been better. There’s not much of a story to be had in Rivals; it’s all told through melodramatic voiceovers that vaguely outline the “rivals” of Redview County: the street racers that make the desert their playground, and the cops that will take them down at any cost. The campaigns can be switched back and forth at any time, and every chapter of each campaign offers three different sets of objectives. At the outset of a chapter, you select a “speedwall:” a set of objectives (“Gold a Hot Pursuit and 2 Races”) that must be achieved in the open world to progress. Of course, while these are the set requirements, there is complete freedom to remain in the world far longer and do anything you’d like. However, completing the Speedwall unlocks the next chapter in the story, a new vehicle, and points that can be used to purchase cars and upgrades. The action of Rivals is intense and heart-pounding. Developer Ghost, with help from Need for Speed veterans Criterion, has absolutely nailed the presentation here. The realistic roar of the engines is appropriately thrilling, and a terrific screen vibration kicks in when racers shoot by. When colliding or landing a jump, the perspective also suitably jolts violently, giving an awesome, visceral feel to the action. Car handling is arcade-y, but fantastic; it feels a bit unrealistic but it’s extremely easy to get the hang of things and in no time you’ll be performing split second 180s and absurd drifts around mountain roads. On the PS4, the game looks fantastic. Cars have a good-looking reflective aesthetic, dust kicks up and gets caked on cars, and water droplets splash against the camera. The next generation’s startling number of particle effects are working in full force here, and sparks and bits of metal fly back at the screen as cars collide. Oddly, the only disappointing thing here is the car wrecks up close, particularly the player car. Metal scraps disappear after a couple of seconds and the destruction is quite lacking for a game in a series that’s essentially morphed into a spiritual successor to the Burnout series. Rivals handily takes the prize for one of the most well-integrated multiplayer experiences in gaming thanks to something called AllDrive. Think of how GTA Online has several players roaming the world at any given time. Then remove the loading screens and menus between events and you have an idea as to how AllDrive works. At any given second, you could be thrust into an event. Getting into a head-to-head race with another player is as simple as getting close to them and pressing a button, and the player accepts by reciprocating a button press. The race quite literally launches right then and there—the GPS springs up and the clock starts–so make sure you keep your foot on the gas. You could be driving down the highway as a cop, see a racer, and turn on your sirens to begin a Pursuit. While slightly limited in that there are only 6 players at a time, it’s still exhilarating to suddenly have on your tail someone who’s an actual cunning human being. This too, makes for more exhilarating events as multiple players can get in on the action. At one point, a match stacked me as a cop, another human cop, and almost a dozen other AI cops against one human racer. This thrilling event was generated naturally; a cop simply found our friend, and everyone else joined in on the mayhem as it passed them, increasing in absurdity and stacking until it came to a head. There is one mild setback to this, however, and that is that there is rarely any time to breathe in Rivals. You will be exposed to races and chases almost constantly, and can even start a head to head race during a pursuit. Long periods of gameplay are almost numbing as cops assault you every second, or racers try to push their luck. The literal non-stop nature of the action is quite impressive, and reaches a higher magnitude than pretty much any other racing game on the market, but it has a way of getting almost exhausting and a bit repetitive after a while. It’s great when it’s happening, but it also makes the game far better in short bursts; as a result, it gets significantly less fun after long periods of play. That said, leaving it for a while and coming back always restores that feeling of adrenaline. The seamlessness is further enhanced with the continued integration of elements from the series trademark Autolog, which while no longer referred to by name still finds its functions used in AllDrive. Anything you do in the world will immediately be stacked against the best score of everyone on your friends list, so you’ll have a consistent means of comparing your scores to others. Rushing through one of the many “Speed Cams” in the game will record your speed at that second, and immediately pull up those of your friends. The system is still a great way to retain a constant sense of one-upmanship with your friends. Rivals is going to be a unique addition to the slew of racing games over the course of this year and next; ditching simulation and gentleman’s racing, this blusters forward with reckless abandon. Ghost Games has put together something of a hybrid of the best elements of Hot Pursuit and Most Wanted, and the result is very good. This is a white-knuckle racer that will leave your palms sweating, and the overall look and feel of the game sets a new bar for this brand of action racer. Occasional repetition and a corny, barely-there story do little do dampen a great racing experience. Need for Speed: Rivals is awesome. 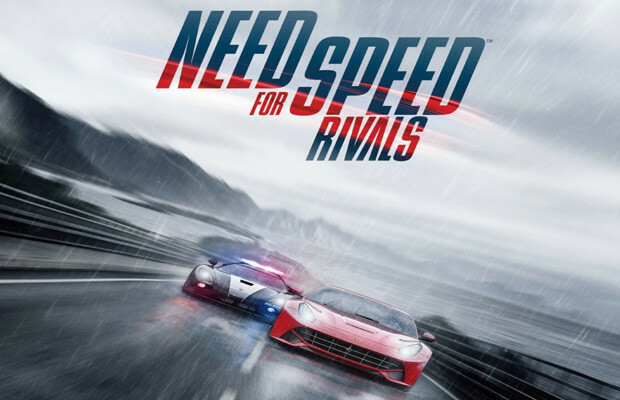 Need for Speed: Rivals was developed by Ghost Games and published by EA. A PS4 copy of the game was purchased by the editor for review purposes. Great review, Chris. I really have been enjoying this game. Glad I picked it up!